Back in December I co-hosted the CARU Pet Food Twitter party and they kindly sent me a variety of their Natural Stews for dogs. Since I don’t eat cooked, wet food, when I receive a product like CARU I usually donate it to my local shelter or rescue. However, this time I decided to nourish my cousins with love and give them the stews. CARU Natural Stews are made with real meat or poultry as the first ingredient and are made without artificial colors, flavors or preservatives as well as no grain, wheat, gluten, corn, soy or animal by-products. The stews are made from only FDA verified human grade ingredients and are processed and handled according to FDA regulations for human food. CARU believes their stews are the go-to solution for dogs that are really picky eaters, have food allergies, are recovering from illness/injury or who just seem to be unhealthy so I put the stews to the test by giving them to my cousins, Levi and Lenox. Both Levi and Lenox are rescues who live with my Aunt Linda D and Lenox, the senior dog, cannot eat kibble because he is missing so many teeth. Lenox is sometimes a picky eater as well so this was the perfect opportunity to see if CARU was the right food for them. 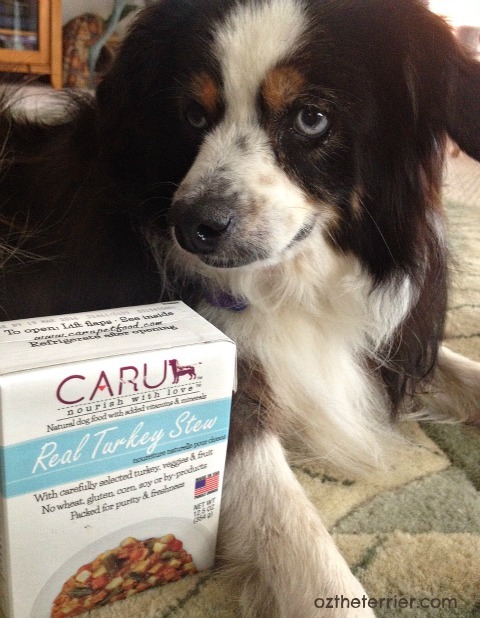 Levi picked CARU Turkey Natural Stew to try because the packaging matched his eyes. I told him that packaging is perfect and it also protects the freshness and taste of the stew without any preservatives. It is pet-friendly BPA-free packaging that is made of up to 70% paper that is easy to open, serve, close, store and even travel with. Levi enjoyed the CARU Turkey Natural Stew a lot but he went back to his other food because Lenox really needs the soft stew. According to Aunt Linda D, Lenox really liked the CARU Natural Stews. The aroma drew him right in and the stew was easy for him to chew. Aunt Linda D was so happy to find a food that Lenox could and would eat. I, of course, am just happy to share some of the wonderful products I receive for my blog with dogs who really need them. I am proud to Nourish my cousins with Love! 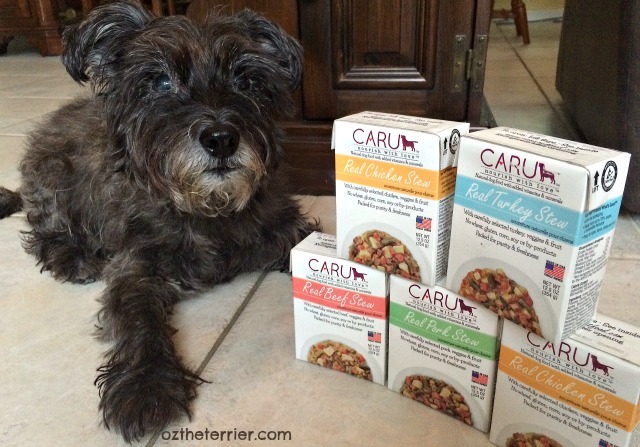 Disclaimer: As stated, I received free samples of CARU Natural Stews for promoting the brand on social media but Oz the Terrier only shares information we feel is relevant to our readers. I received no compensation for this post. Oh yum, yum, I luffs luffs luffs stew!!!! 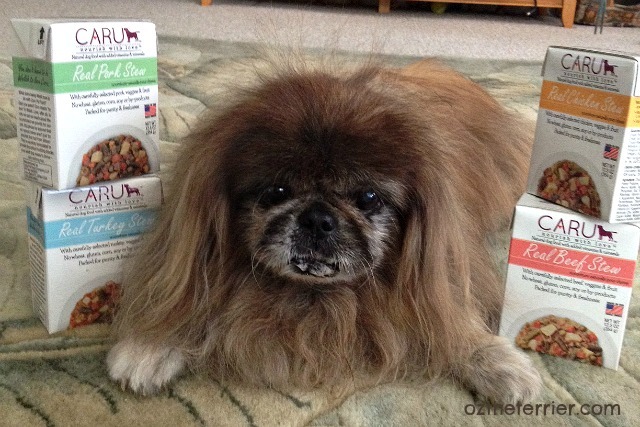 it is good that there are some good quality foods available for doggies who lose their teeth. What a nice cousin you are! Oz you have the best foodables! !,per chance would you like a kitty sibling? If so, I'd like to apply for the position. We had won their food some months ago and their food IS "that good!" Makes a wonderful topper too! How nice of you to share OZ! Looks like Lenox really appreciates it too! Bentley and Pierre love Caru Stews and they make great frozen treats. Sounds like some real yummy stew you gave out there! Mom got her first dog when she was pregnant. The first can of dog food that she opened was the last can of dog food in our home. She said that it made her so nauseous that she would never attempt that again. What a sweet cousin you are, and we're so glad you helped them to find something that Lenox could eat!